On 7 February 2008, the Atlantis Space Shuttle took off from the Kennedy Space Center in Florida, with LTG technology on board. 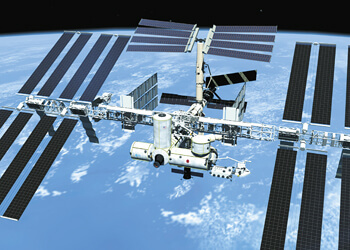 Its mission was to deliver the Columbus laboratory to the International Space Station (ISS). Designed to accommodate a wide range of microgravity experiments, the laboratory will remain in operation until at least 2020. Thanks to its expertise in air technology, LTG landed the contract to optimise the distribution of air in the module. In orbit, the absence of gravity means that air does not circulate by convection. This is why fans have to keep the air moving, to prevent local accumulations of heat and CO2. Engineers built a full-scale model of the Columbus module in the LTG laboratory. Here they simulated air currents under weightlessness while maintaining perfect isothermal conditions. The air-conditioning system had to ensure a minimum air exchange rate at every part of the module in order to keep CO2 from accumulating. By optimising the air flow in these tests, the engineers succeeded in guaranteeing a sufficient supply of oxygen to all zones. LTG had won a similar contract back in the 1970s when Spacelab was being developed. Back then too, its task was air management in Spacelab’s most important component, the habitable module, which also contained lab equipment and key systems such as those for power distribution, life support and environment control. The atmosphere in the module was made similar to that on the earth. In 1998, Spacelab was decommissioned after 22 flights on the Space Shuttle. Part of the laboratory from the 1993 German D2-SPACELAB mission is now on display in the German Museum in Munich. LTG's engineering services know no limits: our know-how in air technology is in demand even in outer space.